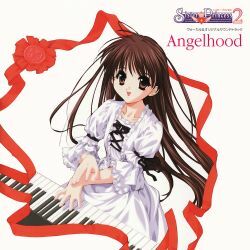 Sister Princess 2 Vocal & Original Soundtrack "Angelhood" / Sister Princess 2 ヴォーカル&オリジナルサウンドトラック「Angelhood」 / Sister Princess 2 Vocal & Original Soundtrack "Angelhood"
Sister Princess 2 Vocal & Original Soundtrack "Angelhood"
A 2-disc set containing "Sister Princess 2" character songs and the PlayStation 2 game's original soundtrack. Also includes other songs performed by rino (from CooRie) and Masumi Ito, the game-sized theme song "Love Flowers" (sung by Natsuko Kuwaya, Hisayo Mochizuki, Yumiko Kobayashi, et al.) BGM soundtracks written by Masumi Ito and Aki Hata.